3.2 billion people (almost half of the world’s population) tuned in to watch the World Cup in 2014. The World Cup has been played 20 times and Brazil holds the most titles with five. Italy and Germany are close behind with four each. It’s rumoured that India withdrew from the 1950 tournament as they were not allowed to play barefoot. One of the venues for the 2018 World Cup, Fisht Olympic Stadium, is the same stadium that hosted the opening and closing ceremonies of the 2014 Winter Games. 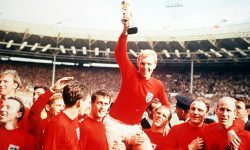 The trophy went missing for seven days in 1966, when it was stolen just prior to the tournament. The average attendance per game in the World Cup 2014 was over 53,000 fans! The World Cup winning country is rumoured to see a baby boom 9 months after the World Cup. In fact, Hyundai even created a commercial based on this. No blog would be complete without this image either, so it’s going in!